Küryakyn makes it possible to replace your functional but unappealing stock footpegs with any of our comfortable and stylish offerings. Küryakyn footpegs are modular in design, so you simply order the correct pair of footpeg adapters for your application along with a pair of the footpegs that best suits your style. 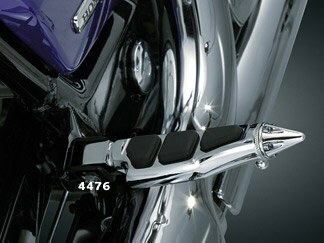 All of our footpegs are beautifully chromed and incorporate long-wearing and replaceable neoprene rubber pads. If any additional mounting hardware is necessary, it will be included with the adapters.